The 2016 Charm is a Limited Edition charm. Celebrate each catch with the enthusiasm of a New Year's Eve party! These Limited Edition charms have 2,016 power to commemorate the new year! These charms are awarded to hunters who compete on the New Year's toboggan course. The 2016 Charm could be obtained as loot while hunting in the Extreme Toboggan Challenge on a New Year's Course, as MEGA Tournament Rewards, and 15 charms were available via donation. The 2016 Charm is available for purchase from other Hunters in the Marketplace. 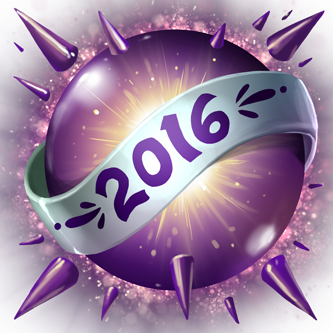 100 charms are in the 2016 Party Pack. 29 December 2015: The 2016 Charm was made available to Hunters as part of the Great Winter Hunt 2015. This page was last edited on 6 February 2019, at 14:02.